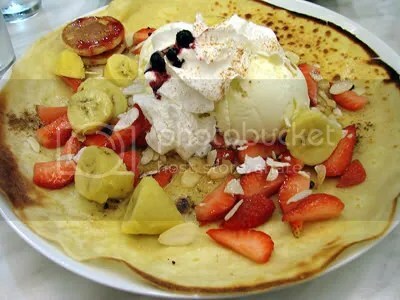 when i was in kl last week, i had the opportunity to taste one of the best pancakes i have ever had. (thank you kak huda for the recommendation!) the name of the place itself just beckons you to enter – paddington house of pancakes. 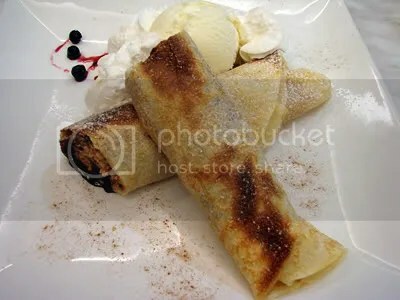 it’s a specialty shop that serves a whole range of pancakes, from savoury to sweet, your usual pancake to variations such as crepes and rolls, dollar pancakes… the list goes on. 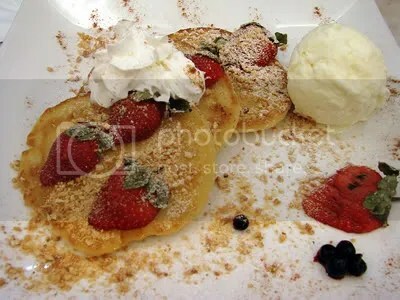 my dad had the usual pancakes with strawberries, a scoop of vanilla ice cream and a dollop of sweetened whipped cream, with a scattering of ground peanuts. 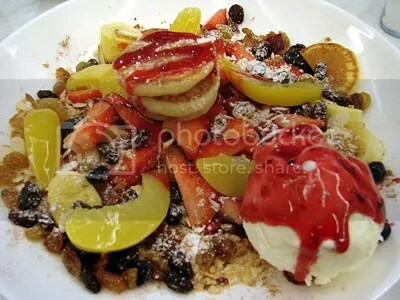 my mum had what they called “dollar pancakes”, which are actually small rounds, buried in a chockful of fruit and nuts. i think it was called the treasure trove. very apt. my sister had these chocolate rolls, which was stuffed with peanuts and peanut butter. i thought it was nice, but they overloaded on the peanuts a little. peanut butter alone should’ve hit the mark.